When The Regency Chess Company began doing business in 2008 we set up our business around a fantastic range of traditional wooden chess sets. 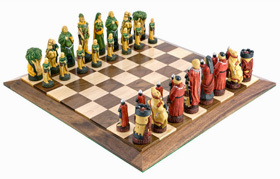 Since this time we have diversified our product range dramatically and one of the key areas of expansion has been into themed chess sets. We set up an alliance with a small selection of suppliers including Studio Ann Carlton in the UK. 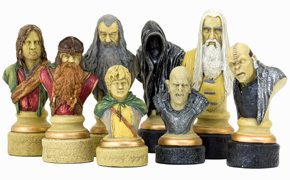 Currently our range of themed sets is extensive, not only do we stock all the run of the mill themed sets, we have also combined some of the themed pieces with our very own chess boards to make unique and beautiful chess sets. We are very proud to be stocking almost the entire range of Studio Anne Carlton themed sets. These sets are beautifully designed and come as a plain, and hand painted options. What always amazes us about these sets is just how well each piece is painted. When you buy one you are not simply buying a chess set, but thirty two beautiful ornaments.